When Nicholas Melehov and Gregory Melehov started MedStar Ambulance, many, if not most, people thought of medical transportation as a simple “ambulance ride.” With rapid advances in medical technology and services that has all changed. Today, medical transportation for the surrounding communities from MedStar provides the latest in emergency diagnostic and care equipment, staffed by highly-trained emergency medical professionals. Our BLS ambulance service providing medical transportation is well-suited for less critical medical situations in which the patient still needs the services of an ambulance and emergency care providers. Our BLS ambulances are equipped with state-of-the-art equipment including an automatic external defibrillator (AED) for heart attacks, blood pressure monitoring equipment and oxygen delivery devices to handle the comfort and medical care needs of every patient. But MedStar provides far beyond just basic medical transportation. 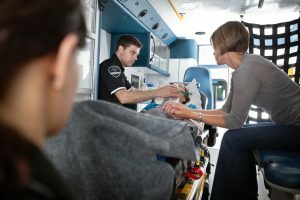 We also offer ALS medical transportation that provides immediate, skilled medical care from our highly-trained and experienced paramedics utilizing our top-of-the-line Zoll X series monitors and HT-70 ventilators to help ensure the best outcomes for patients facing life-threatening injuries or illnesses. For more basic daily medical transportation, our wheelchair van service accommodates the needs of non-emergency patients going to and from appointments, family gatherings, and group events. Our specialty transport bus is capable of transporting multiple patients to different activities and is staffed by our friendly wheelchair van operators. As emergency medical treatment and medical transportation for country has evolved rapidly, Greg Melehov and Nick Melehov have made sure that the services of MedStar have kept pace. Our goal and primary mission is to ensure the safe and rapid transportation and treatment of patients, regardless of their condition and situation in life. To learn more about our medical transportation and emergency medical care services, contact us today.